Bruno Sammartino was born in Abruzzi, Italy and immigrated to the United States at the age of fifteen. Bruno Sammartino idolized a greco-roman wrestler named Batisti who represented Italy in the Olympics in the 30s. 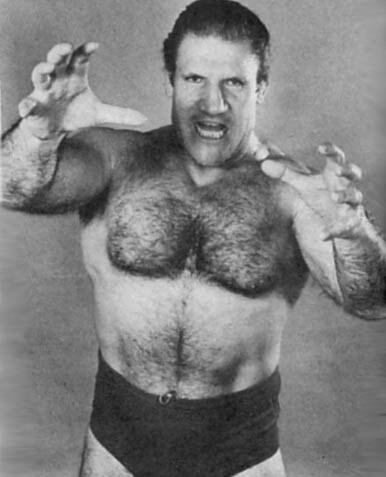 Bruno Sammartino worked out whenever he could at a local gym in Pittsburgh, Pennsylvania at night. Bruno Sammartino’s first job in America was as a construction worker and during the evenings. 1959: Bruno Sammartino debuted in the wild world of Professional Wrestling. May 17, 1963: Bruno Sammartino defeated Buddy Rogers with a reverse backbreaker to capture the WWWF World title. ~~~Bruno Sammartino would hold the WWWF World title for an incredible EIGHT years straight! 1963: Hans Mortier wrestled Bruno Sammartino in Madison Square Garden challenging for the WWWF title. June 3, 1963: Bruno Sammartino defeated Hans Mortier in a Best 2/3 Falls match to retain the WWWF Heavyweight title. ~~~Sammartino submitted to a full nelson; Mortier submitted to a bearhug; Bruno Sammartino won the third and final fall. January 18, 1971: Bruno Sammartino was finally dethrowned by “The Russian Bear” Ivan Koloff. September 30, 1972 – Shae Stadium: Bruno Sammartino vs. Pedro Morales went to a one hour and 16 minutes time limit draw. December 10, 1973: Bruno Sammartino defeated Stan Stasiak to recapture the WWWF World title. ~~~Bruno Sammartino’s second WWWF World title reign lasted just over 3 years, Bruno was the 1st to win the title twice. November 17, 1973 – MSG: Bruno Sammartino defeated Ivan Koloff with Gorilla Monsoon as special guest referee. December 16, 1975 – MSG: Bruno Sammartino defeated Ivan Koloff in a 15 ft. high steel cage match to retain in front of 30,000 fans. February 2, 1976 – MSG: Bruno Sammartino beat Billy Graham by referee stoppage due to several cuts inflicted on Graham by Bruno. March 29, 1976 – MSG: Bruno Sammartino and Tony Parisi defeated Billy Graham and Ivan Koloff. April 26, 1976 – MSG: Stan Hansen defeated Bruno Sammartino by referee stoppage after Sammartino suffered a cut above his eye. ~~~Bruno Sammartino also suffered a “fractured vertebrae” (broken neck) after receiving The Lariat before a stunned audience. June 25, 1976 – Shae Stadium: Bruno Sammartino defeated Stan Hansen by count-out. December 12, 1976 – MSG: Bruno Sammartino defeated Stan Stasiak in a “Sicilian Stretcher Match”. March 7, 1977 – MSG: Bruno Sammartino defeated Ken Patera with Gorilla Monsoon as Special guest referee. Bruno Sammartino trained and introduced Larry Zbyzsko into the wrestling business. Bruno Sammartino and Larry Zbyzsko eventually became enemies and started a bitter feud. April 12, 1980: Bruno Sammartino defeated Larry Zbyszko in a “Texas Death Match”. August 9, 1980 – Shea Stadium: Bruno Sammartino defeated Larry Zbyszko in a classic Steel Cage match. Bruno Sammartino also feuded with his other protege, Spiros Arion, whose mind was tainted by the evil Fred Blassie! May 1, 1977: Superstar Billy Graham defeated Bruno Sammartino for the WWWF World title. June 27, 1977 – MSG: Bruno Sammartino vs “Superstar” Billy Graham went to a time limit draw. 1984: Bruno Sammartino officially became known as “The Living Legend”. March 17, 1985: Bruno and David Sammartino defeated Paul Orndorff and Bobby Heenan. March 31, 1985 – Wrestlemania 1: David Sammartino w/Bruno Sammartino vs Brutus Beefcake w/Johnny V. went to a no contest. May 1985 – House Show: Bruno and David Sammartino defeated Johnny Valiant and Brutus Beefcake. September 28, 1985 – House Show: Bruno Sammartino and Paul Orndorff vs Roddy Piper and Bob Orton. October 26, 1985 – House Show: Bruno Sammartino and Paul Orndorff beat Roddy Piper and Bob Orton in a Cage Match. April 2, 1986 – Wrestlemania 2: Bruno Sammartino participated in the 20-Man Invitational Battle Royal. June 1986 – House Show: Tito Santana and Bruno Samartino vs Randy Savage and Adrian Adonis. July 1986 – House Show: Tito Santana and Bruno Samartino vs Randy Savage and Adrian Adonis in a Steel Cage Match. 1986: Bruno Sammartino officially retired from in-ring action but stayed on as a color commentator. July 19, 1987 – World Wrestling Federation – House Show: Bruno Sammartino vs. Honky Tonk Man. August 29, 1987: Bruno Sammartino (last match) and Hulk Hogan defeated King Kong Bundy and One Man Gang. Bruno Sammartino’s claim to fame (one of them, I suppose) was that during his career he had never lost a Steel Cage match. April 2003: The Madison Square Garden network is working on a documentary on Bruno Sammartino, and is scheduled to air in June. February 19, 2004: Bruno Sammartino declined WWE’s offer to attend a Hall of Fame ceremony the night before Wrestlemania. May 18, 2004: Sammartino was honored in Pittsburgh on the 41st Anniversary of winning the WWWF title from Buddy Rogers. ~~~It was on May 17, 1963, in Madison Square Garden, when Sammartino made Rogers submit with a bearhug in 47 seconds. February 2005: The Associated Press reports Bruno Sammartino refused an invitation to be inducted in the 2005 WWE Hall Of Fame. August 27, 2005 – WrestleReunion: Larry Zbyszko defeated Diamond Dallas Page to win five minutes with Bruno Sammartino! ~~~DDP actually used a diamond cutter on Zbyszko, then pulled him on top of him so Larry won the match. ~~~Bruno Sammartino attacked Larry Zbyszko and started choking him out until he was pulled off very quickly. March 5, 2006 – Legends PPV: Dory Funk Jr. and Mike Graham w/Bruno Sammartino beat Tully Blanchard and David Flair w/JJ Dillon. ~~~Dominic Denucci w/Bruno Sammartino defeated Larry Zbyszko w/Lord Zoltan (Zoltan inadvertently hit Larry Zbyszko). May 15, 2006 – RAW: WWE showed a “This Week in Wrestling History” video featuring Bruno Sammartino’s win over Buddy Rogers. September 16, 2006 – Ring of Honor: Bruno Sammartino made a rare and inspiring appearance to praise ROH and its performers. March 30, 2007 – Ring of Honor: Bruno Sammartino made his second appearance and had some in-ring interaction with Larry Sweeney. April 28, 2007 – AWF: The Patriot and Tom Brandi w/Bruno Sammatino defeated Saddam Insane and Sheik Cicero w/King Idu Stinq. ~~~Later that Night: “Living Legend” Bruno Sammartino was inducted into the American Wrestling Federation Hall of Fame. June 26, 2007: Bruno Sammartino underwent major back surgery for a third time under surgeon Dr. Joseph Maroon. “The Big Cheese” Sal Corrente wrote (On June 30, 2011): We want to address any rumors regarding Bruno Sammartino and his current health situation. If you have read Bruno’s Auto Biography you are aware that he had Rheumatic Fever as a child that caused damage to the valves in his heart. He was very sick for three plus years and came very close to dying as a child. It clearly didn’t affect him for many years he grew strong and had great stamina in the ring. It was recently discovered that the valves had detriorated and had to be replaced immediately. He has had the surgery and began a rehabilitation process that should last around three months. I have been told that Bruno’s doctor’s expect a full recovery and he should have the heart of a forty year old man when the rehab is complete. April 6, 2013 – WWE Hall of Fame: Bruno Sammartino is inducted into the WWE Hall of Fame. April 18, 2018 – Bruno Sammartino passes away at 82 years old from natural causes.